The program, performed by the dancers of the Paris Opera & Ballet, is a tribute to the world famous choreographer, on the tenth anniversary of his death, whose genius stretched across decades and art forms. 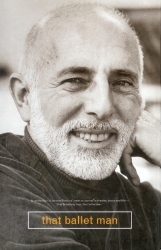 Jerome Robbins is perhaps best known for his choreography and co-direction of the massively influential film West Side Story and the Broadway hit Fiddler on the Roof. But Robbins was also an enormously successful choreographer for theatre and ballet during his lifetime and his works continue to be performed around the world. This program salutes Robbins by presenting the very different sides to his imagination, ranging from the playful to the intriguingly dark to the laugh-out-loud funny. 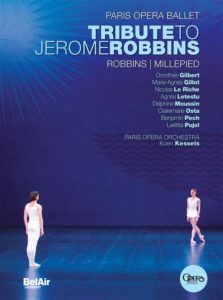 Produced by François Duplat and Antoine Perset, directed by Vincent Bataillon, the program features Jerome Robbins’ ballets In G Major, In the Night, and The Concert and includes a world premiere by Benjamin Millepied. Shot on location in New York City and starring an ensemble cast of New York City Ballet dancers, NY Export: Opus Jazz takes Jerome Robbins‘ 1958 “ballet in sneakers” and reimagines it for a new generation in this scripted adaptation. After winning an Audience Award at the 2010 South by Southwest Film Festival, the film aired nationally on PBS’ Great Performances series and was nominated for the Rose d’Or Award. “A BALLET IN SNEAKERS: JEROME ROBBINS AND OPUS JAZZ” The director’s cut of the documentary by Anna Farrell and Matt Wolf which includes additional scenes not aired on television. 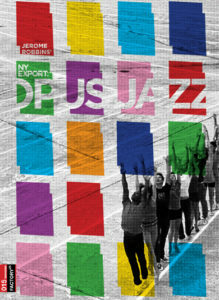 “JEROME ROBBINS’ BALLETS: USA” A documentary commissioned by the State Department in 1958 which includes footage of the original cast performing and rehearsing NY Export: Opus Jazz. “YOUNG AGAIN: NY EXPORT: OPUS JAZZ” An Essay by John Lithgow. 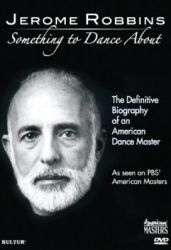 Jerome Robbins’s story is as distinctively American as his choreography. Born Jerome Wilson Rabinowitz in New York City to Russian-Jewish immigrant parents, Robbins (1918–1998) became a Broadway chorus boy in 1938 before joining Ballet Theatre and New York City Ballet, ultimately dancing lead roles. Robbins also became one of the 20th century’s most highly regarded choreographers, including for the 1957 Broadway hit “West Side Story”. Other Broadway successes include “On the Town”, “The King and I” and “Peter Pan”, and significant ballets such as “Fancy Free”, “The Cage” and “Dances at a Gathering”. With precision, lucidity and insight, Village Voice dance critic Jowitt (“Time and the Dancing Image”) chronicles Robbins’s extensive career, as well as his struggle with bisexuality, ambivalence about his Jewish heritage, and his decision to name names before the House Committee on Un-American Activities in the 1950s. Given unrestricted access to Robbins’s personal and professional papers, Jowitt adds a new vulnerability and humanity to the legend: Robbins was infamous for his perfectionism, insecurity and temper. “I… still have terrible pangs of terror when I feel my career, work, veneer of accomplishments would be taken away,” wrote the man who worked alongside Bernstein and Balanchine, “that I panicked & crumbled & returned to that primitive state of terror —- the facade of Jerry Robbins would be cracked open, and everyone would finally see Jerome Wilson Rabinowitz.” Both critically sophisticated and compulsively readable, this is a must for theater and dance devotees. 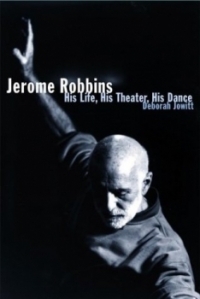 This first-ever book on the director and choreographer, Jerome Robbins – written by a close friend of thirty years – takes the reader on a magical tour of a genius at work. Using hundreds of never-before-seen images, Christine Conrad has put together a stunning pictorial biography of the renowned director and choreographer of such major theater works as West Side Story, Peter Pan, Fiddler on the Roof, and a principal choreographer for over forty years at New York City Ballet. 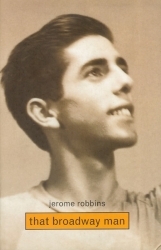 Family snapshots, rare photographs of Robbins as a young actor and dancer, backstage and rehearsal pictures, production photographs, old clippings – all these important artifacts documenting the life of this unique artist are given context by Conrad’s interlinking text and the use of Robbins own words culled from interviews over fifty years. In Conrad’s introduction, readers will get for the first time a rare look into the personal life of this very private man who actively discouraged any books about himself during his lifetime. Christine Conrad’s close friendship with Robbins began in the mid-Sixties and lasted until his death. One of their most frequent ongoing conversations was the struggle to do good work. Conrad’s combined visual and textual narrative emphasizes the important threads running through Robbins’ creative work: his influences, working methods, perfectionism, fight for recognition and credit, and collaboration with key figures such as Leonard Bernstein, George Balanchine, and George Abbott. In addition, Conrad has been granted rights to include select materials from highly personal journals that Robbins kept from 1972 to 1984 which are under restricted access according to the terms of Robbins’ will. The journals – written on Japanese rice paper notebooks – represent an extraordinary document of Robbins’ inner and outer life and are frequently remarkable candid. Even those familiar with Robbins’ ballet, theater and film work will be astonished by the range of imagination displayed in these pages which provide a rich, visual illustration of why Robbins is considered one of the most important artists of the 20th Century. In a style that is at once accessible, visceral, and pictorial, the book celebrates Robbins’ extraordinary contribution to art and entertainment – providing a view of him that is a delight to the mind, the eye, and the soul.